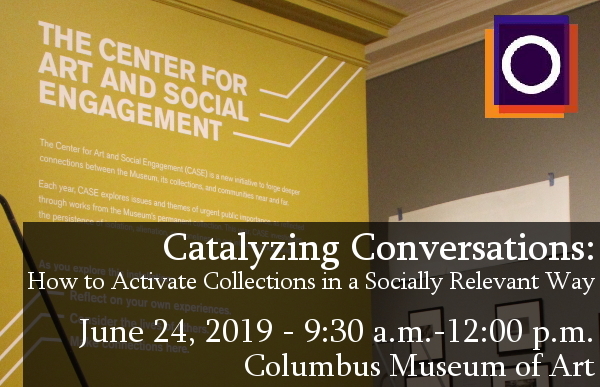 Join OMA at the Columbus Museum of Art, Monday, June 24 from 9:30 a.m. - noon for the hands-on workshop, "Catalyzing Conversations: How to Activate Collections in a Socially Relevant Way!" Join OMA for our hands-on June Workshop - "Catalyzing Conversations: How to Activate Collections in a Socially Relevant Way"! Events of the past few years have thrown a stark light on the nature of museum-community connection, and prompted many to ask: What could be the role of a museum to respond to events that rock our communities? and What are the moral implications of “business as usual”? While artists often tackle issues of their time, institutions tend to be conservative in their response. Recently, however, some in the museum field have signaled increasing willingness to take a more explicit role as community actor. One of many fundamental challenges in playing a more active social role is to activate collections in ways that are accessible, relevant and engaging to visitors. For museums to catalyze conversations, and potentially action, visitors must feel their ideas and full selves are welcome and valued. When: Monday, June 24, 2019, 9:30 a.m. – 12:00 p.m.